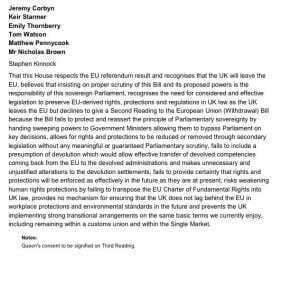 UPDATE: In a long and feisty debate on the Second Reading of the EU Withdrawal Bill, the opposition insisted that a Labour amendment was necessary to stop Brexit turning into a dangerous undemocratic power grab in which Theresa May and her ministers could reinterpret decades of human rights and EU legislation as they see fit. And without the debate and votes of parliamentary scrutiny that we are accustomed to in this country. The Labour amendment stated that “this House respects the EU referendum result and recognises that the UK will leave the EU” but that the EU (Withdrawal) Bill as drafted by the Government hands “sweeping powers” to ministers allowing them to “bypass parliament.” However it was defeated just after midnight, and the Bill passed onto its Second Reading by 36 votes. Yet the Bill could still face defeat as MP’s – including 12 Tory MP’s – tabled crucial amendments to be examined as the Bill as it moves on to Third Reading. Former Conservative attorney-general Dominic Grieve who called the bill an “astonishing monstrosity” intimated that he may rebel at Third Reading. And if the seven Labour MPs who defied Jeremy Corbyn’s whip to vote the Bill through and as few as seven of Theresa May’s Conservative colleagues who had sounded alarms over its anti-democratic elements during the debate rebel, the PM could yet face defeat. EU Debate: "We cannot trust these ministers." Last week Theresa May faced similar accusations from MP’s in her own party, but it seems that the Conservative Party whips whipped them into towing the Prime Minister’s line on the Brexit Bill. Even human rights watchdogs Amnesty International and Liberty called on MP’s from both sides of the House of Commons to amend the Bill to include a binding commitment on the Government to prevent it eroding Brits’ rights. “As it is, the Withdrawal Bill would see Parliament surrender broad power to Ministers to change laws without proper scrutiny, setting a dangerous precedent. Parliament would be less sovereign and that cannot be right,” added Rachel Logan, Law and Programme Director at Amnesty International UK. “Although there is more to do, this decision means we can move on with negotiations with solid foundations and we continue to encourage MPs from all parts of the UK to work together in support of this vital piece of legislation,” said the Prime Minister after the debate.